This article was also published in The Guardian. How the rich soaked the rest of us: The astonishing story of the last few decades is a massive redistribution of wealth, as the rich have shifted the tax burden. Over the last half-century, the richest Americans have shifted the burden of the federal individual income tax off themselves and onto everybody else. The three convenient and accurate Wikipedia graphs below show the details. The first graph compares the official tax rates paid by the top and bottom income earners. Note especially that from the end of the Second World War into the early 1960s, the highest income earners paid a tax rate over 90 percent for many years. Today, the top earners pay a rate of only 35 percent. Note, also, how the gap between the rates paid by the richest and the poorest has narrowed. If we take into account the many loopholes the rich can and do use far more than the poor, the gap narrows even more. 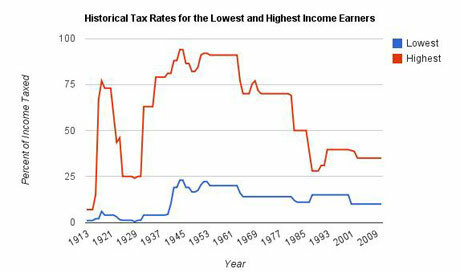 Historical tax rates for the highest and lowest income earners. The lower taxes the rich got for themselves are one reason why they have become so much richer over the last half-century. Just as their tax rates started to come down from their 1960s heights, so their shares of the total national income began their rise. As the two other Wikipedia graphs below show, we have now returned to the extreme inequality of income that characterized the US a century ago. Share of national income taken by top tranches of earners. The graph above shows the portion/percentage of total national income taken by the top 1 percent, the top tenth of a percent, and the top 100th of a percent of individuals and families: the richest of the rich. The third graph compares what happened to the after-tax household incomes of Americans from 1979 to 2005 (adjusted for inflation). The bottom fifth of poorest citizens saw their income barely rise at all. The middle fifth of income earners saw their after-tax household income rise by less than 25 percent. Meanwhile, the top 1 percent of households saw their after-tax household incomes rise by 175 percent. Relative increases in net household incomes of Americans from 1979 to 2005. In simplest terms, the richest Americans have done by far the best over the last 30 years; they are more able to pay taxes today than they have been in many decades, and they are more able to pay than other Americans by a far wider margin. At a time of national economic crisis, especially, they can and should contribute far more in taxes. Instead, a rather vicious cycle has been at work for years. Reduced taxes on the rich leave them with more money to influence politicians and politics. Their influence wins them further tax reductions, which gives them still more money to put to political use. When the loss of tax revenue from the rich worsens already strained government budgets, the rich press politicians to cut public services and government jobs and not even debate a return to the higher taxes the rich used to pay. So it goes – from Washington, to Wisconsin to New York City. How do the rich justify and excuse this record? They claim that they can invest the money they save from taxes and thereby create jobs etc. But do they? In fact, cutting rich people's taxes is often very bad for the rest of us (beyond the worsening inequality and hobbled government it produces). Several examples show this. First, a good part of the money the rich save from taxes is then lent by them to the government (in the form of buying US Treasury securities for their personal investment portfolios). It would obviously be better for the government to tax the rich to maintain its expenditures, and thereby avoid deficits and debts. Then, the government would not need to tax the rest of us to pay interest on those debts to the rich. Second, the richest Americans take the money they save from taxes and invest big parts of it in China, India, and elsewhere. That often produces more jobs over there, fewer jobs here, and more imports of goods produced abroad. US dollars flow out to pay for those imports and so accumulate in the hands of foreign banks and foreign governments. They, in turn, lend from that wealth to the US government because it does not tax our rich, and so we get taxed to pay for the interest Washington has to give those foreign banks and governments. The largest single recipient of such interest payments today is the People's Republic of China. Third, the richest Americans take the money they don't pay in taxes and invest it in hedge funds and with stockbrokers to make profitable investments. These days, that often means speculating in oil and food, which drives up their prices, undermines economic recovery for the mass of Americans and produces acute suffering around the globe. Those hedge funds and brokers likewise use part of the money rich people save from taxes to speculate in the US stock markets. That has recently driven stock prices higher: hence, the stock market recovery. And that mostly helps – you guessed it – the richest Americans who own most of the stocks.